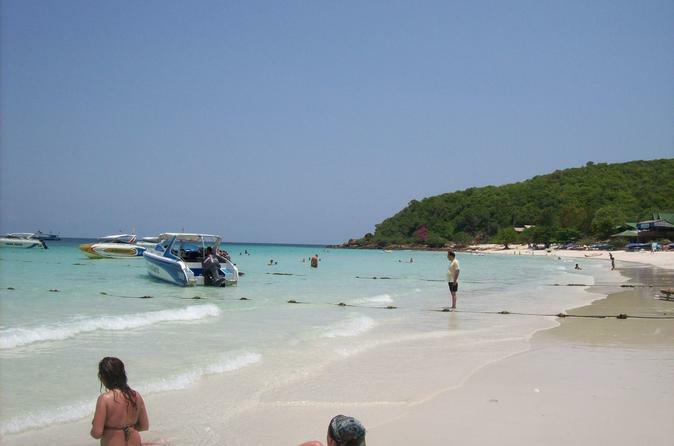 Embark on this popular excursion from Pattaya by speedboat. 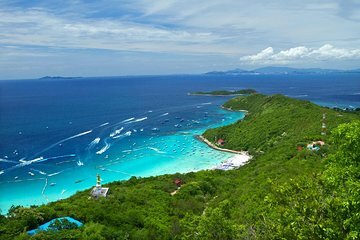 Spend the day relaxing on the scenic shores of this lovely island, where you’ll be able to swim in crystal blue waters, soak up the sun and savor a seafood lunch prepared with the local catch! The trip was excellent, beautiful beach and great food. The only setback was we were rushed by the organiser onboarding/outboarding the boats because the group was mixed with other tour. but overall, we enjoyed!! I enjoyed the boat ride over t the island, beach was absolutely stunning. However, the food was not the best. Soup and prawns were fine but the rest of the meal was not good. Also, it would be nice if there were clean change rooms by the beach. Much squalor. Sea dirty. On the same island we spent only 2 hours. Nice trip, little delay to comeback from the island to pattaya, also i have to said, before get in to the boat in pattaya there is a woman who say the picture she is taken is for insure of the trip, which is not true, the picture is to put in a frame so, when you comeback if you want the picture you have to pay 100bath, is not a big deal but just keep in mind that, overall the trip was amazing. This was the absolute worst experience Ive ever paid for, too start we were almost 3 hours late getting too the Island and when I asked for a reason I pretty much got a grunt and the person walked away, we get to the Island and we are dumped off the back of the boat into 3 feet of surf while being barked at too hurry up and get off, Then our so called guide disappears with out leaving us with ant kind of information about when and where we are suppose to go for our Sea food lunch or what time the Boat returns back to the main land, my wife and I fended for our self for lunch and pretty much stayed local to the area where we were dropped off so we would not miss the return boat since we had no idea when it would leave, this place was so over crowded with people and boats there was no way possible too snorkel, and the roped off area for swimming was a joke, all day long we were bothered by locals trying too sell you something and we had to pay for anything and everything except for oxygen, to sit in a chair cost 100 Baht, to use a restroom was 50 Baht, to shower off after being in the sea water was 50 Bath... So our guide shows up just before 3 and starts barking at everyone too hurry up and get on the boat and the only thing I could think of is thank god this night mare is almost over, no I was wrong, we get back too shore too be left standing in the heat for nearly 2 hours waiting for our return transportation too our Hotel while the people running this trip was busy trying to sell pictures of everyone on the boat, end up getting put on a open air Tok Tok truck instead of a nice A/C van like our morning pickup, And Thanks my Wife And I Had an Awesome Honeymoon adventure experience, Yeah Right... can I submit a minus star rating? ?..